This 6 mile section goes from the Hwy. 21 trailhead near Claybaugh Creek up 600 feet to the summit of Taum Sauk Mountain- Missouri's highest peak at 1,772 feet. The trailhead is a large gravel lot off of Hwy. 21. Right from the trailhead the trail climbs gently for about half a mile before descending to Claybaugh Creek. After its first climb and descent the trail goes near Claybaugh Creek. You can hear the creek from the trail but can't quite see it. From the creek, the trail climbs through a neat area with pines and large boulders. This is about a mile from the trailhead. Next the trail climbs through a little glade area with some little views across the valley. After the little glade area, the trail meanders through the forest. It steadily goes uphill but it's a gradual climb. 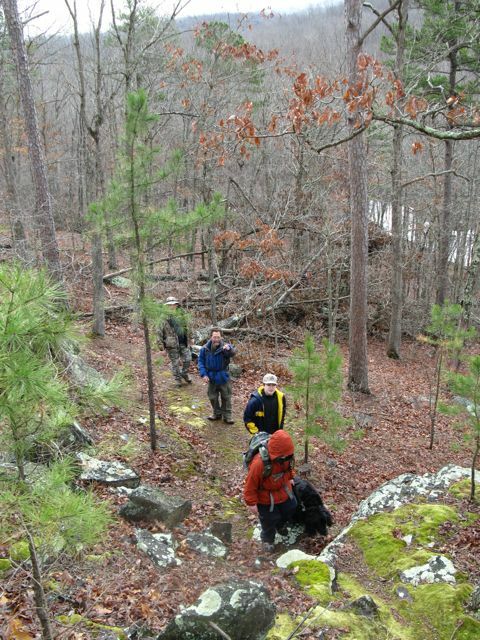 About 3 miles from the trailhead, the trail crosses a neat, rocky glade area. There are some nice views towards the south. If you hike after a rainstorm, you might find little waterfalls and streams running through the rocks. 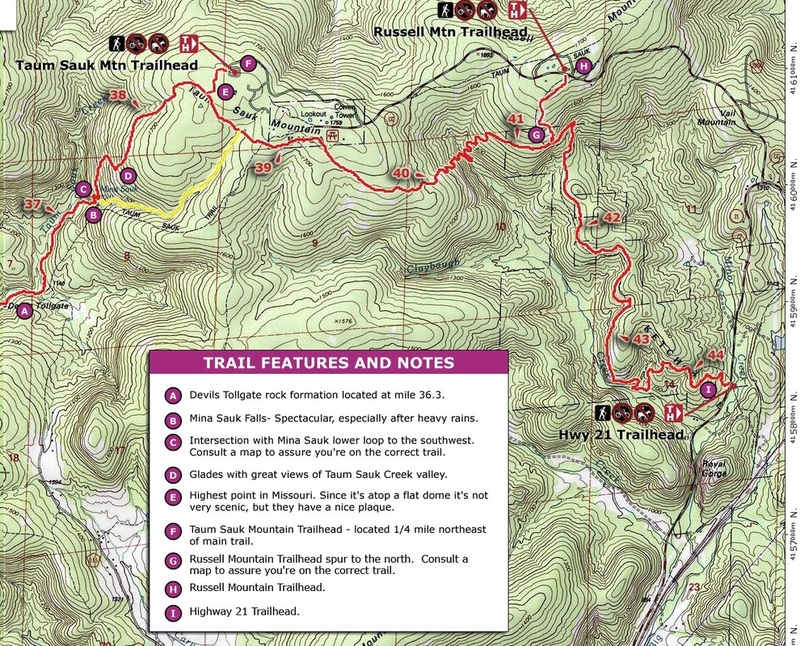 3.2 miles from the trailhead, you'll come to the Russell Mountain trailhead spur. 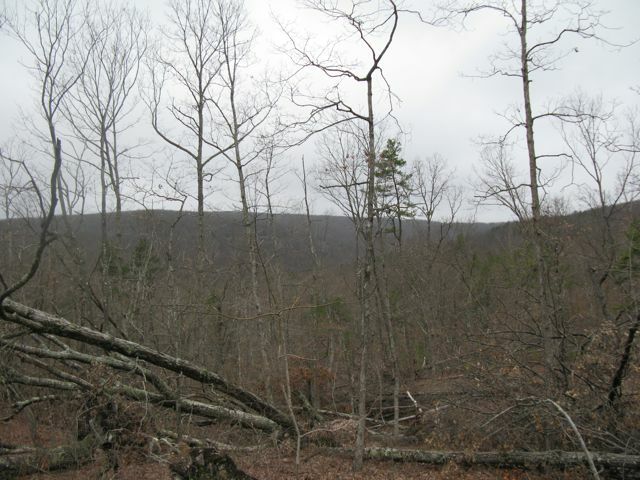 Due to some private property on Russel Mountain, the spur is being rerouted by the OTA and will be re-opened in early March. If you take a right on this spur, it will climb for half a mile and end up at the Russell Mountain Trailhead on Hwy. CC. To continue on the Ozark Trail, go straight ahead at the junction. Soon after the junction, the trail starts to descend through an open forest/ glade. There are some nice views here as the trail switchbacks down to Claybaugh Creek. About dropping about 200 ft, the trail crosses Claybaugh Creek. The crossing is an easy hop across rocks. 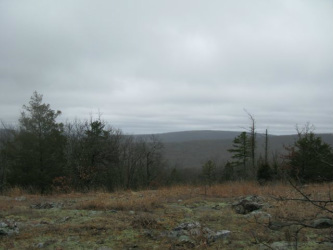 From the creek, the trail climbs about 400 feet in the next mile to be on Taum Sauk Mountain. The trail has some nice views back to the glades you hiked through on your descent to the creek. The last mile and a half to the trailhead from the top of the climb go through a few more glades. You know you're getting close when you see a spur to the Taum Sauk campground. Continue straight and you'll soon intersect the Mina Sauk Falls loop. If you take a right, you'll reach the trailhead in about .4 miles. Along the way, you'll pass a spur to the highest point in Missouri. Unlike your hike, the highpoint is a boulder in the forest with no views. If you want to extend your hike, take a left on the Mina Sauk Falls trail to add 3 miles to your hike. 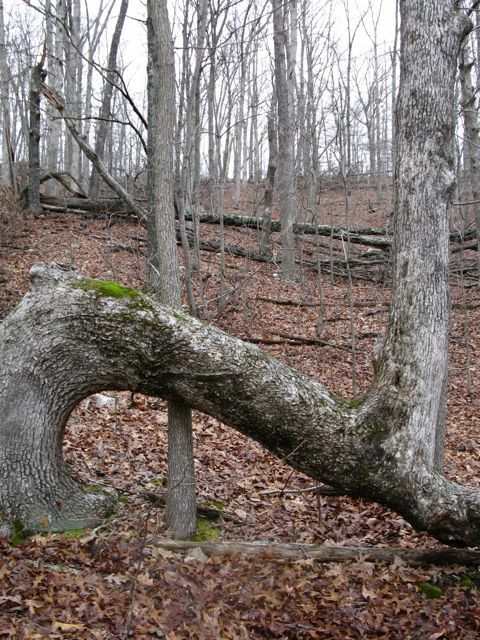 You'll get to see the highest waterfall in Missouri and many more glade views.